Since our humble beginnings in 2005, AlterG® has come a long way. So too has the evolution of physical therapy, often progressing at a dizzying pace. In keeping with our commitment to being a pioneer in advanced rehabilitation technology, we’ve continued to add to and improve upon our suite of tools. As with most things, our story began with a problem: astronauts were losing weight and bone density after prolonged periods in zero-gravity environments. This was in many ways the genesis of the patented NASA Differential Air Pressure (DAP) technology at the core of our flagship product, the AlterG Anti-Gravity Treadmill™. Since those early days, we’ve worked hard to constantly upgrade and expand our line. Aside from DAP, you’ll find new features like Stride Smart, the AlterG Assistant (automated sessions) and our highly sought after Digital Video Monitoring System. These tools empower clinicians and clients to rehab with intention, leading to optimal recovery times and better results. These technologies are available with our expanded family of Anti-Gravity Treadmill technology. This line now includes three products: the Pro, Via and (most recently) the Fit to accommodate a wider breadth of clinician and patient needs. 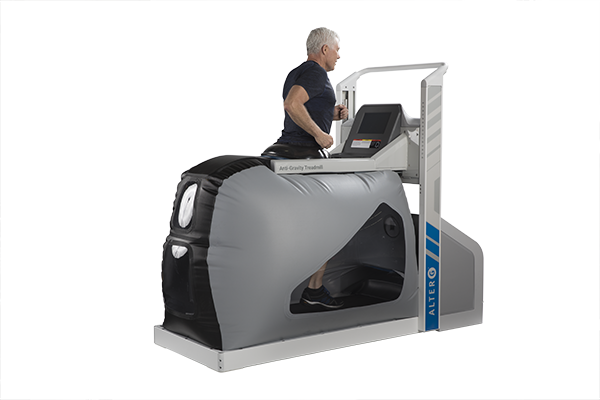 AlterG Pro 500 – Featuring the superb Woodway Treadmill, gait data, video monitoring, the AlterG Assistant, and a high operating capacity, the Pro 500 is designed for the most intense training applications. AlterG Via 400 – A model with higher performance speeds, ideal for intensive sports training and a multitude of physical therapy uses. Includes gait data, video monitoring, and the AlterG Assistant. AlterG Fit – The newest addition to our family of treadmills, the Fit 100 is the right mix for clinicians seeking performance and value. AlterG M/F 320 with Stride Smart owners are eligible to add the Digital Video Monitoring System. As we continue to grow and expand, so do the needs of our valued customers. To us, customer experience is everything, from the client-clinician experience working with our treadmills, to the tools, support, and resources we provide. We work hard to keep our library of free clinical resources up to date, including use cases and clinical protocols. In addition, we are committed to delivering prompt and friendly customer support. Although our product lines have improved and expanded, and our business has grown to include some of the world’s top athletes and organizations, our core mission has remained the same: to push the limits of innovation and progress in physical therapy with gravity-defying technology. To speed recovery the right way. Consider this the first in our series of posts diving deeper into the developments we hope will pioneer a new age in advanced rehabilitation technology. We’ll take a close look at what these technologies can deliver for you, patient; and you, dedicated clinician.